Compassion is a central value in my life, something I aspire to access and practice even when it isn’t easy. Lately I’ve come to think that it matters to me precisely because it has taken me a long time to cultivate. I don’t mean that I’ve behaved routinely without compassion in the past—at least, I hope I haven’t. My mother taught me at a young age to “walk a mile in another’s shoes,” and encouraged me to see things from other peoples’ points of view whenever I could. If I couldn’t, she said, I could at least make myself aware that the other person had a point of view, one that was separate from mine, yet equally true. Whenever I hear the famous saying of “be kind, for everyone you meet is fighting a hard battle,” I think about my mom and her words. Even so, my tendency as a young person was toward rigidity and hard lines. I was quick to make judgments about what was good or bad, right or wrong. And I was never more judgmental than when I was judging myself. It pains me to look back on how unforgiving I was with myself through my teens and twenties; not just anorexia and cutting, which were the obvious physical/behavioral manifestations of this harshness, but also the impossible standards I held myself to, and the mercilessly punishing thoughts I let loose on myself when I inevitably didn’t measure up. Recovery from perfectionism is a story that many women I know can relate to; it’s a journey that I observe many friends going through as we all get a little older and wiser. But it’s really only recently that I’ve realized how my punitive self-treatment prevented me from approaching others with compassion. I’ve often heard it said that it’s impossible to extend compassion to other people when you’re incessantly preoccupied with judging and censuring yourself. Self-forgiveness and self-love foster empathy; when we’ve done the hard work of learning how to cut ourselves some slack, we’re more able to meet other people where they are. Lately, and really for the first time, I’ve been practicing self-compassion. It isn’t something I mastered through trying; it’s something that happened to me, out of necessity. So much of the identity I used to take pride in has been stripped away in the last five or so years, leaving me in a position of having to accept what’s still here. And depression has been real and poignant enough recently that I can’t help become more gentle with myself; it felt less like a conscious loosening of expectations than a matter of survival. The wisdom is true: the better friend I am to myself, the deeper my love for other people becomes. I’m so much gentler and more humorous and caring these days than I ever have been, not only in my behavior but also in how I feel. There’s a softness I’m carrying around, a sense of heart, and a humility that I just didn’t have before. I look back on my uncompromising younger self with affection, but I’m so glad to be outgrowing the sharp edges.
. . . a method for connecting with suffering — ours and that which is all around us — everywhere we go. It is a method for overcoming fear of suffering and for dissolving the tightness of our heart. Primarily it is a method for awakening the compassion that is inherent in all of us, no matter how cruel or cold we might seem to be. Truthfully, this practice does go against the grain of wanting things on our own terms, of wanting it to work out for ourselves no matter what happens to the others. The practice dissolves the armor of self-protection we’ve tried so hard to create around ourselves. In Buddhist language one would say that it dissolves the fixation and clinging of ego.
. . . we often cannot do this practice because we come face to face with our own fear, our own resistance, anger, or whatever our personal pain, our personal stuckness, happens to be at that moment. I love this. I welcome any reminder that suffering can ultimately connect and bring us closer. True pain often feels isolating, lonely, and unique—like something no one could possibly understand, even if you tried to explain it. But if we allow ourselves to fully experience and digest pain, it can render us more sympathetic to others and their struggles. 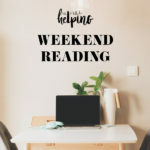 This week I’m also sharing an article that a friend sent to me last week. The author, Eric Barker, suggests five questions that can help to put difficult times into perspective. The questions are good, and I think they’re particularly useful for managing stress and anxiety, as they all invite us to make distinctions between what really matters and what doesn’t. Maybe these articles will encourage you to treat yourself more gently this week, to greet a setback or struggle with softness. I hope they do, and I hope you’ll enjoy the other links, too, as well as these fabulous vegan recipes from around the web. 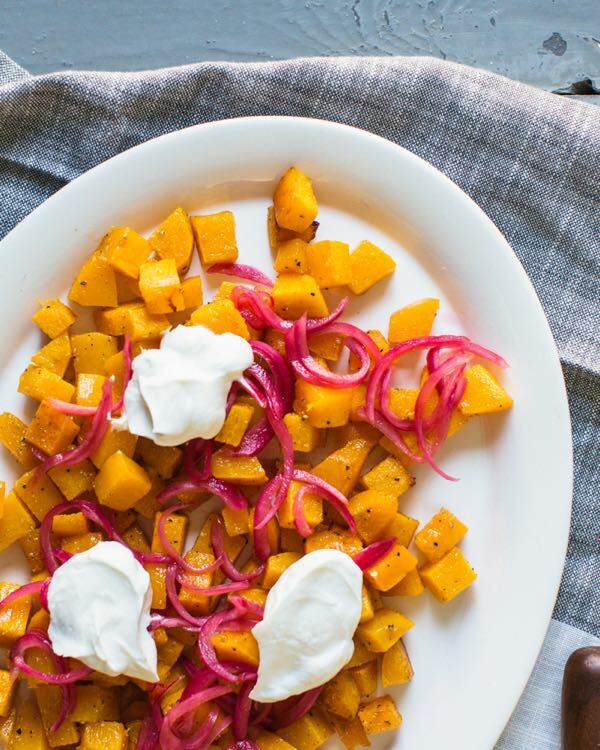 A simple, flavorful veggie side dish for fall, courtesy of the the lovely Sonja and Alex at A Couple Cooks: butternut squash with pickled onions. I love the idea of adding fluffy dollops of cashew cream! 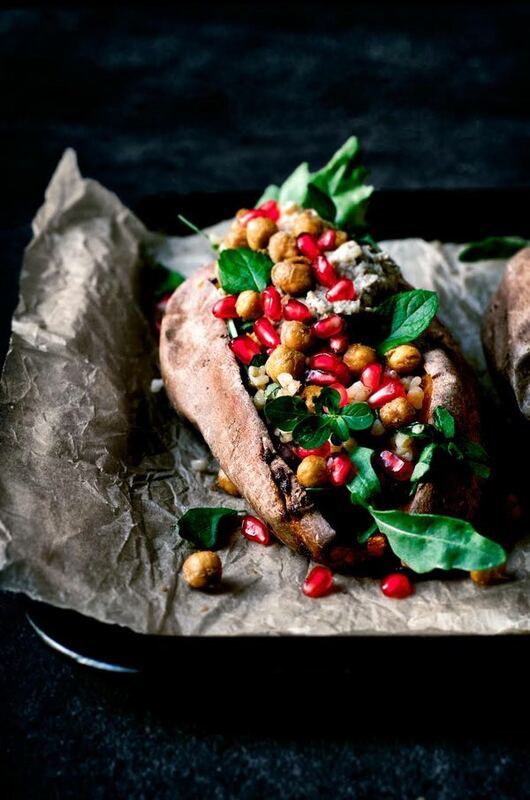 Alexandra’s cozy stuffed sweet potatoes are Mediterranean-inspired comfort food at its very best. I love everything about this meal. I always add some sort of crunchy or textured topping to creamy soups—I appreciate the contrast and variety. 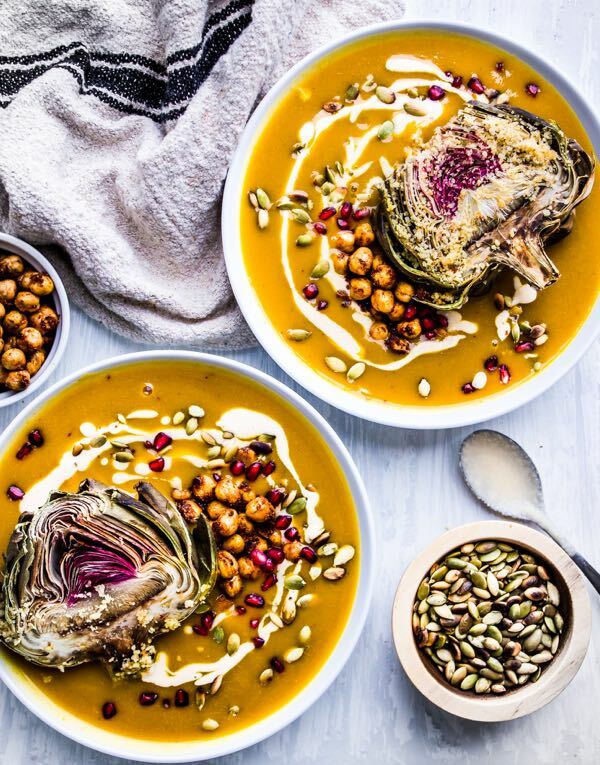 Gina takes soup topping to a whole new level with these gorgeous bowls, a combination of pumpkin soup, crispy baked artichokes, roasted chickpeas, nuts, and pomegranate seeds. They’re pretty enough to serve for a holiday meal! 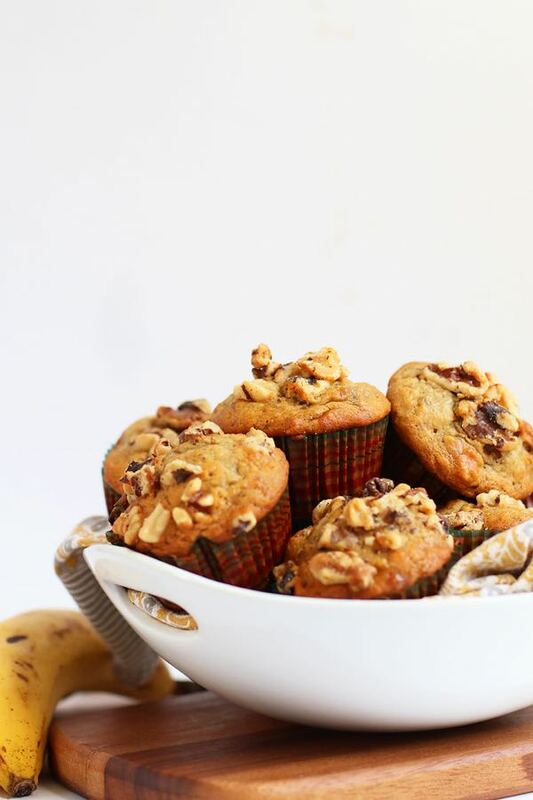 I saved breakfast for last today, in the form of Sarah’s simple, delicious vegan banana nut muffins. 1. First, Pema Chodron explains the meaning and intention behind tonglen practice. 2. Eric Barker lists five questions that can help to carry you through difficult times. 3. An interesting perspective on childrens’ mental health, this article explores whether the decline of “play”—unstructured, curious, exploratory free time—may be linked to the rise of depression and anxiety among young people. 4. I spent a lot of time last year studying the nocebo effect—the worsening of health symptoms as a result of expectation—specifically as it relates to food and digestive health. Much more tends to be written about the placebo effect (which is the opposite, an improvement in symptoms due to a patient’s expectation of beneficial results), but the phenomena are linked, and I think they’re both fascinating. This article gives a good introduction to the nocebo effect and its remarkable power. 5. Three American scientists were awarded this year’s Nobel Prize in physiology or medicine. Jeffrey C. Hall, Michael Rosbash, and Michael W. Young’s work sheds light on the nature of so-called circadian rhythms—specifically, they were able to isolate and identify a specific gene that controls biological rhythms of waking and sleeping. This article says more about their work and its implications for work, schools, and policy-making. I spent a little time yesterday simmering a fragrant, sweet-and-sour batch of apple raisin chutney. It’ll be folded into some tasty, Indian-inspired wraps, and I’m excited to share the recipe in a couple days. Happy Sunday! Ahimsa is a guiding belief for me too. So much so that I have it tattooed on my arm! Although it’s there for me, it’s turned out to be a great conversation starter. 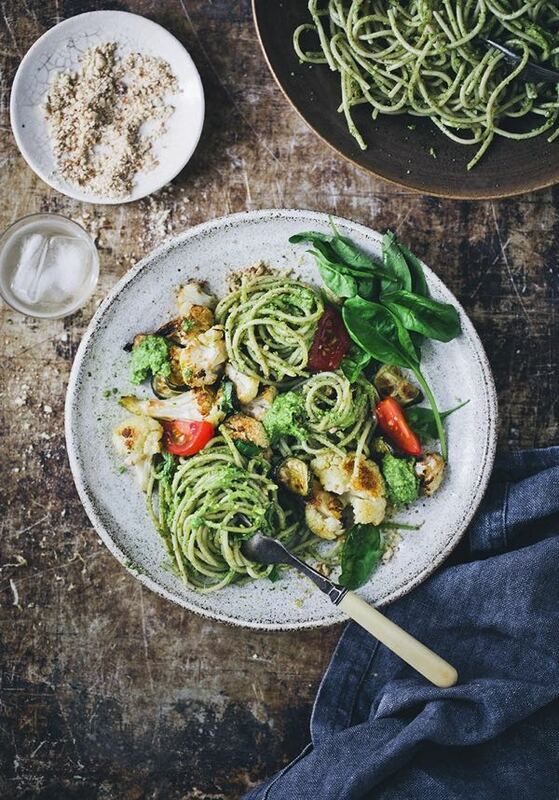 Thanks so much for sharing all of these delicious recipes and thoughtful reads each week. I’m always eager to read it! Thank you so much for this. Especially saying that the practice frightened you. I tend to over-empathize and it causes me anxiety, but I think the practice of breathing in the “problem” (which i do automatically) can be balanced by breathing out some strength to those dealing with the problem. It’s a challenging balance to try to balance my own need for not burning out and the concern, even drive, to help others. The recipes look wonderful as always and I’m eager to try them. Thank you for taking the time to share. As happens so often lately, lots of what you shared today resonates deeply with me. Perfectionism, rigidity, a tendency to judge myself harshly and see things in black and white sound very familiar! I too have a need for radical compassion towards myself and it’s become more and more clear over time. The more work I do, the more I see that needs to be done. I guess that’s the clearing away of the cloudy veil. It’s a good thing right? But sometimes so uncomfortable! But all that work eventually brings a lot of joy and more comfort too. What a process…life…I think it does call for a bowl of pumpkin soup. Thanks as always for sharing! I really enjoyed reading this post, Gena – especially hearing you describe ahimsa and how it relates to the way you’ve treated yourself. I’ve been through something similar too. I’d like to discuss this with you further – please look out for an email from me soon! Well, here’s a strange thing: I discovered tonglen when I was at the lowest ebb of my life, praying to never wake up again and angry when, every morning, I did. I was emotionally devastated, simultaneously in agony and empty. But weirdly, I could practice tonglen and gain some comfort from it, perhaps because the darkness I already felt was like a black hole pulling everything in, then what was left behind felt light and bright. I was already so filled with fear and pain that more of it was irrelevant, so I didn’t shrink from the practice at all. The comfort I received from this is more elusive for me since I’m more stable. So proud of you, Gena, for practicing self compassion and also for being brave enough to talk about your journey to that point. 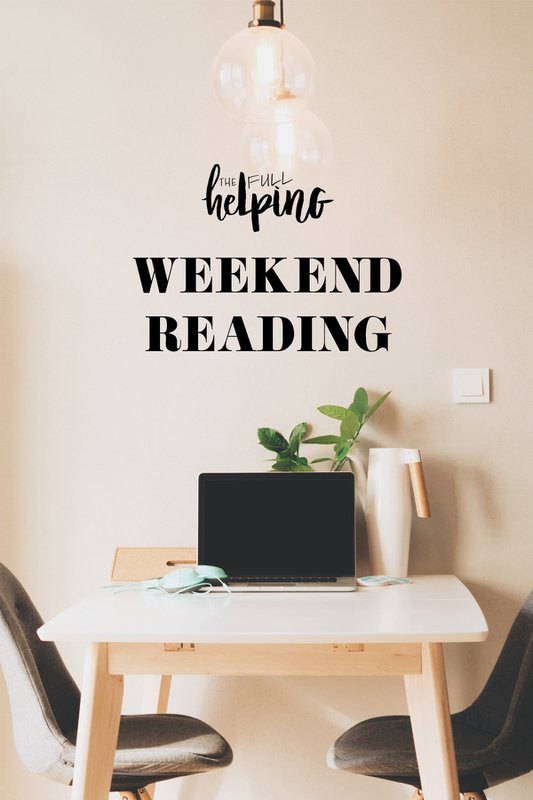 Such a touching article – every time I read something from you it makes me feel a little stronger. I think about Ahimsa often but remembering to practice self care can be left behind for a lot of people, and it’s certainly of equal importance to caring for others. Thank you for sharing, as always. Gena! Lovely post as usual. I really love all of Brene Brown’s books too, particularly The Gifts of Imperfection and Rising Strong. I’m going to read When Things Fall Apart now! I already get Pema Chodron’s weekly emails and they are always so perfect and helpful.